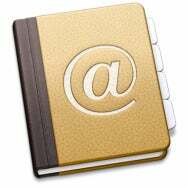 In Lion, Address Book has been radically redesigned. For starters, it has been made to look like a traditional leather-and-paper address book: Pages fan out from a center with faux stitching and shadowing; they seem to be bound by a brown leather cover. The app now looks a lot like the Contacts app on the iPad. Those pages have a purpose: They separate two distinct views of your contacts. In OS X 10.6, you had a window with three panes—Group, Name, and Card. Double-click on a name in that middle column and that card would pop up in a window of its own. In Lion, following the book visual metaphor, Address Book breaks that into two sets of “pages”: One shows you a list of your groups on the left and a list of contacts on the right; click on a contact in that list (or click on the red-ribbon page-marker) and the page turns. In that second view, you see your contacts list on the left and individual contacts on the right; click on a contact in the list on this page and you get a pop-up window with that contact. When viewing a contact (either as a page in the book or as one of those pop-out windows), there’s now a Share button next to the Edit button. Click Share and it will open a new e-mail message in Mail with that contact’s vCard attached. In the past, you’d drag a card from Address Book directly into Mail to share that vCard; you can still do that in Lion. Like other Lion apps, you can resize Address Book by clicking and dragging on any corner or any side. But unlike some of the other apps that are bundled with Lion, Address Book doesn’t offer a full-screen mode. Adding a photo from iPhoto or Aperture to a contact. If you like to match faces with names, the new Address Book can now pull pictures of your contacts from your iPhoto library. Double-click on the picture box on a card, then click on the Import Face From iPhoto button in the lower left corner. 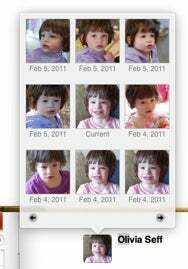 You’ll be presented with a grid showing up to eight faces associated with that name in iPhoto—complete with dates those shots were taken—with the current contact photo (if any) in the middle. If you have more than eight photos of a contact, you can use arrows at the bottom of the photo pop-up window to scroll through the others. Note that if you use Aperture, you’re not out of luck. Though Apple specifically names iPhoto on that button, if you’ve tagged faces in Aperture you can use those too. In fact, if you use both iPhoto and Aperture and have Faces enabled in each, Address Book will show you all faces for a particular person, regardless of which library they’re in. Find a picture you like, click on it, and then you get the standard picture window in which you can pan and zoom the image, apply effects, then choose it with a click of the Set button. Acknowledging the importance of social networking, Apple has added two new fields to Address Book. The first is Twitter. Add a contact’s Twitter account name (Address Book takes care of the @ symbol automatically) to it, and you can then click on the word Twitter to bring up a pop-up menu. Click on View Profile on that menu, and Address Book will launch the official Twitter Mac app (if you have it installed) and take you to that person’s profile. Click on Send Tweet instead and it opens Twitter with a new message to that contact. The second new field is called Profile. It gives you the option of adding profile names for Facebook, LinkedIn, Flickr, or MySpace user (as well as Twitter, again). If you pick Facebook from the pop-up menu then enter a Facebook username (the thing that appears at the end of the URL when you visit someone’s profile page), you can then click on the word Facebook and select View Profile (takes you to the user’s profile page in Safari) or View Photos (takes you to that person’s photo page). For Flickr accounts, the pop-up gives you a single View Photostream option that opens in a browser. LinkedIn and MySpace offer View Profile alone. There’s also a Custom option when picking which service to use, so you could enter, say, someone’s Ping account name. But if you click on those customer profiles, nothing will happen. As you begin to add an address for a chosen service (LinkedIn, say) in Edit mode, Address Book automatically inserts another entry (for Twitter, which is first on the list); that’s meant to make it easy to add as many social networking profiles as you want for a contact without having to manually add the field numerous times. Apple says Address Book offers improved syncing with Yahoo contacts. Changes made to contacts are immediately reflected in both Address Book and in your Yahoo address book, and you can view just your Yahoo contacts by selecting Yahoo from the Groups page. You can now add birthdays to contacts without having to include the year. (Useful for contacts who don’t like to share their ages, perhaps). But when you do add a year, the upcoming age now shows up in your iCal Birthday calendars. You can start a FaceTime call from Address Book by clicking on the label (Home, Work, and so on) next to an email address and choosing FaceTime from the pop-up menu. You can do the same thing currently in Snow Leopard, but I’m guessing that Apple is touting this feature out as new because FaceTime comes as part of Lion, rather than as a separate Mac App Store download; all Lion users will be able to use it.